From March 21-25, the World Affairs Council of Kentucky and Southern Indiana hosted 10 international teachers. The visitors, from Turkey, Cote d’Ivoire, Gabon, Russia, Uzbekistan, and Vietnam, were all English as a Second Language educators studying ESL teacher training programs. Our visitors traveled across the state, first meeting with professors from the Masters in Teaching ESL program at the University of Kentucky. Next, they traveled to Frankfort to tour the state capitol and meet with officials from the Department of Education to discuss Kentucky’s foreign language standards. Finally, on Friday, the group saw these training programs put into action through a visit to ESL Newcomer Academy at Shawnee High School, a middle and high school that works with students beginning their first year of school in the United States. These students are typically at beginning levels of English proficiency, so instructors help students develop their English skills and provide emotional support during their transition to American life. The visitors sat in on English classes at Newcomer before meeting with officials from the Jefferson County Public Schools system to discuss the hiring of ESL teachers and curriculum development. Our international visitors’ trip to Louisville concluded with a fun cultural day on Saturday. The group visited the Muhammad Ali Center and Kentucky Derby Museum before finishing the day with a dinner cruise on the Ohio River. From Louisville, the visitors went to Chicago, IL to participate in the TESOL International Convention and English Language Expo. Our visitors enjoyed their visit to Kentucky and will take many valuable skills back to the training centers and universities in their home countries! Visit the group’s Facebook Album! This program was funded and sponsored by the U.S. Department of State, Office of English Language Programs and implemented locally by FHI 360 & World Affairs Council of Kentucky and Southern Indiana. Delegates From Iraq Volunteer with Kids! https://www.worldkentucky.org/wp-content/uploads/2018/01/26757939_1950163608345975_2555094579266667932_o.jpg 1200 1600 Laura Duncan https://www.worldkentucky.org/wp-content/uploads/2017/05/imageedit_1_5849451921.png Laura Duncan2018-01-18 20:25:392018-01-18 20:25:39Delegates From Iraq Volunteer with Kids! About 11 percent of Kentucky students in grades K-12 were enrolled in a foreign language course in 2014-15. That’s according to the American Council of International Education. That statistic is one of the reasons a local organization wants to get more high school students in the commonwealth to become more globally competent. The World Affairs Council of Kentucky and Southern Indiana is now taking applications for its new Global Citizenship Certificate Program. Beth Malcom, president and CEO of the Kentucky YMCA Youth Association, served on the education committee that designed the program. “Global competency is being aware of the world around you and that there are other lenses, perspectives, experiences, traditions that may differ from your own,” Malcom said. She said the program would complement almost any field of study, including science and high-tech fields that are heralded by some as more lucrative and essential for the future. Malcom said along with cognitive benefits, having a global mind and being multilingual can be beneficial for college admissions. “There is a sense that Kentucky is not an international place but if you look at the manufacturing that’s here we have a huge, large number of international companies with plants and factories here,” said Xiao Yin Zhao, executive director of the World Affairs Council of Kentucky and Southern Indiana. That includes companies like Toyota, she said. Zhao said the council — a nonprofit based in the Portland neighborhood — is investing approximately $50,000 into the pilot program. The Global Citizenship Certificate Program is a free, two-year program for high schoolers in Kentucky and Southern Indiana. Students complete requirements such as language learning and attend events such as the Model U.N., culminating in a capstone project. The program will accept about 100 students. Progress is tracked by an online application. Zhao said it is not lost on officials that some students may not be able to complete the program because of inadequate internet access or because some may not have globally-minded events nearby that meet requirements. She said at least in this first year, more remote areas may not be ready for a program but coordinators can gauge interest from the number of applications from those areas and try to help those students in the future. The application to the Global Citizenship Certificate Program asks for basic information about prospective students, questions about their interest and what they think they’ll get out of the program. Applications are being accepted until October 15. This article, written by Roxanne Scott, has been reposted from WFPL News. Written by the Agence France-Presse in Seoul. See the original article on the Guardian. South Korea has offered to hold rare military talks with the North to ease tensions after Pyongyang’s first intercontinental ballistic missile test earlier this month. Monday’s offer, the first since South Korea elected the moderate Moon Jae-In as president, came as the Red Cross in Seoul proposed a separate meeting to discuss the reunion of families separated by the 1950-53 Korean war. The South’s defence ministry proposed a meeting on Friday at the border truce village of Panmunjom, while the Red Cross offered to hold talks on 1 August at the same venue. If the government meeting goes ahead, it will be the first official inter-Korea talks since December 2015. Moon’s conservative predecessor, Park Geun-hye, had refused to engage in substantive dialogue with Pyongyang unless the isolated regime made a tangible commitment to denuclearisation. The Red Cross said it hoped for a positive response from its counterpart in the North; mooted family reunions in early October would be the first in two years. Millions of families were separated by the conflict that sealed the division of the peninsula. Many died without getting a chance to see or hear from their families on the other side of the heavily-fortified border, across which all civilian communication is banned. Only about 60,000 members of divided families are still left in the South. “North Korea should respond to our sincere proposals if it really seeks peace on the Korean Peninsula,” said Cho Myoung-gyon, Seoul’s unification minister in charge of North Korea affairs. Cho stressed that Seoul “would not seek collapse of the North or unification through absorbing the North” and urged Pyongyang to restore inter-Korea communication channels, including a shuttered military hotline. Moon, who took power in May, has advocated dialogue with the nuclear-armed North as a means of bringing it to the negotiating table and vowed to play a more active role in global efforts to tame the South’s unpredictable neighbour. But Pyongyang has staged a series of missile launches in violation of UN resolutions, most recently on 4 July when it test-fired its first ICBM, a move which triggered global alarm and a push by the US president, Donald Trump, to impose harsher UN sanctions on the country. Washington has also called on China, the North’s sole ally, to put more pressure on Pyongyang to rein in its nuclear ambitions, which have advanced rapidly under the North’s leader, Kim Jong-un. “We make the proposal for a meeting … aimed at stopping all hostile activities that escalate military tension along the land border,” the defence ministry said in a statement. [NEW]The European Union offered European support for South Korean efforts to negotiate with North Korea, but said it was also considering tougher sanctions on Pyongyang following its first intercontinental ballistic missile test. In a statement Monday, the EU’s executive arm condemned the test earlier this month as a “serious threat to international peace and security” and urged an end to such actions. The latest missile test – which Kim described as a “gift” to the Americans – was seen as a milestone in Pyongyang’s quest to build a missile capable of carrying a nuclear warhead that can hit the US mainland. The proposed meetings, if realised, would be a “rare opportunity to ease tension that has built up for 10 years”, said Cheong Seong-chang, analyst at the Sejong Institute, a thinktank. “It would at least help let off some steam out of the current crisis, although the North would still maintain that it would not give up its weapons programmes,” he said. The agenda for the meeting could include moves to suspend propaganda campaigns operated on both sides of the border for years, Cheong added. The South’s military has deployed dozens of giant loudspeakers along the tense border to blare out a mix of world news, K-pop songs and other propaganda targeting young North Korean soldiers. It has also occasionally launched giant balloons containing anti-Pyongyang leaflets across the border despite warnings of military retaliation by the North. The North has responded with its own propaganda broadcasts and sent anti-Seoul leaflets via giant balloons across the border. Read the original article on The Washington Post. Image credit: The Washington Post. BANKI, Nigeria — The soldiers arrived in the middle of the night, tearing through the village of Nigerian refugees, barging into stick huts where families slept in knots on the floor. For years, those refugees had been on the run from Boko Haram insurgents, finally escaping across a dried riverbed that served as the border with Cameroon. They had settled in the village of Majina, where they farmed beans and millet. “A peaceful place,” the men said. And then, in March, the Cameroonian soldiers arrived. The troops rounded up the refugees haphazardly and pushed them into military trucks, often separating parents from their children, according to witnesses. The refugees soon realized where they were headed: back to one of the most dangerous corners of Nigeria. Today, they are living in a displacement camp in Banki, a city racked by one of the world’s biggest hunger crises. The United Nations would eventually put a label on what happened that night and many others to follow — “forced return.”Over the past few months, at least 5,000 Nigerian refugees were rounded up in Cameroonian villages and refugee camps and expelled to a region under frequent attack by insurgents, according to U.N. officials. Some aid officials think the actual number of those forcibly returned is over 10,000, including people evicted in sporadic operations since 2013. The Cameroonian government has denied driving out the Nigerians. As the number of refugees around the world soars — topping 20 million — they are facing growing hostility from host countries and shrinking protection from the international legal framework put in place decades ago to defend such vulnerable people. A forced return like the one reported in Cameroon emblematizes the most extreme and unforgiving reaction to those searching for a haven. Many countries are taking less-drastic steps that have still alarmed refu­gee advocates. Over the past three years, Pakistan has pressured hundreds of thousands of long-term war refugees from Afghanistan to return home, despite the dire poverty and violent insurgency in their homeland. In Kenya, a court blocked the government from sending more than 200,000 inhabitants of the Dadaab refu­gee camp, mostly Somalis, back to a nation beset by war and a hunger crisis. But human rights groups say many of the residents are being pressured to leave anyway. International human rights groups last year accused Turkey of expelling thousands of Syrian refugees, a charge the government denied. Under the 1951 Refugee Convention, ratified by 145 countries — including Cameroon — victims of war or persecution should not be returned to nations where they will face serious threats. But that edict is being ignored, according to human rights groups. The Office of the United Nations High Commissioner for Refugees (UNHCR) has sought to reach agreements with countries that are sending refugees home, to ensure that only voluntary repatriations occur. But the agency’s assistance came too late for thousands of Nigerians in Cameroon. Aid groups are still unsure what prompted what they call a mass eviction. Some U.N. officials say the refugees were probably forced out in advance of a large military operation. Other aid groups say that Cameroon, one of the world’s poorest nations, has simply grown tired of hosting Nigerians. Cameroon has been inundated by refugees in recent years, with more than 300,000 people fleeing wars in the Central African Republic and Nigeria. Cameroon’s government has rejected the UNHCR statements on the forced returns. “I’m telling you there were no forced expulsions,” Richard Etoundi, head of the protocol unit in the Ministry of External Relations, said in a phone interview. The Cameroonian military acted so hastily in removing the refugees that it inadvertently swept up a group of Cameroonian women and children in a raid in the village of Keraoua. They now sleep on the floor of an unfinished building in a bombed-out side street in Banki. Abba Goni, 76, fled Banki nearly three years ago on a green bicycle with “China” stamped on the frame, riding on the packed sand from village to village, an old man much faster on two wheels than on his two gnarled feet. Goni was born and raised in Banki, once a city of 150,000 surrounded by fertile farmland, just over a mile from the Cameroonian border. In September 2014, the Islamist extremists known as Boko Haram surged into town on trucks and motorcycles, shooting wildly and burning buildings. Goni’s first escape on the green bicycle was in the dead of night. His two wives and nine children followed. For a few weeks, they lived outdoors, subsisting on whatever fruits they could find. When Boko Haram caught up with them, Goni got back on his bicycle, heading toward Cameroon. Since Goni was a boy, members of his Kanuri ethnic group had moved back and forth between Cameroon and Nigeria without any documents. Boko Haram, too, had crossed the border with impunity. But the group’s stronghold remained in Nigeria, and Goni knew that if he headed deep enough into Cameroon, he would most likely be safe. In 2015, he and his family arrived in Majina, where some local men allowed him to cultivate a small patch of farmland. “It was a decent life,” he said. Parts of Nigeria were meanwhile inching closer to famine. When the aid group Doctors Without Borders finally got access to Banki last summer, after the military drove out Boko Haram, aid workers found a hunger crisis, with more than 10 percent of children suffering from severe malnutrition and people dying of preventable diseases. For Goni and his family, their hamlet in Cameroon wasn’t just an escape from Boko Haram, but also a refuge from starvation. The government of Cameroon, though, was struggling to provide for so many refugees. Residents of northern Cameroon blamed food shortages on refugees. In some cases, the two populations clashed. Experts see that frustration reflected in other countries where refugees have been pressured to leave. of the Migration Policy Institute, a Washington-based research organization. In Majina, Goni never experienced that antagonism. On that March day, when he heard the sounds of trucks and men shouting, Goni first assumed Boko Haram had arrived. Then he looked outside and saw the men in uniform. “Who is Nigerian?” the soldiers shouted, Goni recalled. Goni asked if he could at least collect his clothes, blankets, food and his bicycle. The soldiers refused. Everything happened quickly. When he looked around, in the back of the speeding military truck, he found only one of his wives and two of his children. The rest had been left behind. The following morning, Goni got his first look at what was left of Banki. Entire blocks had been flattened, most likely by military airstrikes. Displaced people were living in abandoned houses. Although aid groups had begun to distribute food and open rudimentary clinics, the Nigerian military still controlled access, posting checkpoints and barring residents from leaving town. That meant no farming in nearby fields, no collecting of firewood and no possibility of leaving Banki again. After being interrogated by Ni­ger­ian soldiers, Goni was directed to an abandoned building. UNHCR gave him a mat and a blanket. And he had a new home: one room with 18 people sleeping on the floor. A month into his time in Banki, he and many of the other deportees were eating only one meal a day. A few blocks away, in another gray, unfinished building, 32 Cameroonian women and children waved their documents — Cameroonian birth certificates and voter registration cards — when they spotted a visiting journalist. “We kept telling the soldiers, ‘We are from Cameroon,’ but they brought us here anyway,” said Fati Kadi, 40. Her two children had been left behind during the raid, she said. Stories of other forced returns emerged throughout March and April. More than 2 million people had already been displaced internally in Nigeria’s war with Boko Haram. With the flow of repatriated refugees from Cameroon, that number was rising. Two hundred miles from Banki, in the city of Ngala, the border superintendent watched one day in April as the Cameroonians deposited hundreds of Nigerians on a bridge that connects the two nations. “They just wanted to get the Nigerians out,” Mohammed Gadam, the border chief, said in an interview. Many others in Ngala had chosen to return after they were convinced by Cameroonian and visiting Nigerian soldiers that life was much better in Nigeria, with free-flowing aid and much-improved security. When Falta Ali, 23, arrived back in Ngala in March, two years after she fled, she saw that the city was in ruins. Aid groups set up tents, but not enough. The international community was running out of money for food aid. Ali’s 6-month-old, Yagana Buhama, quickly developed whooping cough. In March, UNHCR reached an agreement with the Nigerian and Cameroonian governments, mandating that refugees return to Nigeria only voluntarily. The number of forced returns appears to have dropped off recently, according to UNHCR. “There is now a framework for voluntary returns,” said Cesar Tshilombo, head of UNHCR’s sub-office in northeastern Nigeria. But other relief workers say people are still being pressured to go back to a dangerous, desperate place. “They are threatened by Cameroonian authorities until they agree to return,” said a relief worker in Banki who interviewed refugees last month. He spoke on the condition of anonymity because he was not authorized to comment publicly about the issue. in the previous six months, “making it the world’s largest mass forced return of refugees in recent years,” the group wrote. It added that the United Nations was abetting the exodus by providing subsidies of $400 per refu­gee. The Pakistani government denied the allegations of coercion. For now, the thousands of refugees, like Goni, who have been forced back to Nigeria have pragmatic questions. When will they be reunited with their families? How will they get their belongings in Cameroon? Will they ever be free to return? Read the original article on the New York Times. Image Credit: the New York Times. WASHINGTON — The Supreme Court on Friday ruled in favor of an immigrant whose lawyer falsely told him that pleading guilty to a drug charge would not lead to his deportation. When the immigrant, Jae Lee, learned the truth, he sought to go to trial after all. Chief Justice John G. Roberts Jr., writing for the majority in the 6-to-2 decision, said Mr. Lee should be able to reopen the proceedings against him and take his chances at trial even though the evidence against him was quite strong. Mr. Lee moved to the United States from South Korea with his family in 1982, when he was 13. After graduating from high school in New York, he moved to Memphis, where he became a successful restaurateur. He was a lawful resident but not a citizen and had never returned to South Korea. Mr. Lee was prosecuted for possessing the drug ecstasy with the intent to distribute it, and his lawyer urged him to plead guilty in exchange for a lighter sentence. The lawyer falsely told Mr. Lee that he would not be subject to deportation after he served his sentence, which turned out to be a year and a day. On learning the truth, Mr. Lee filed a motion to vacate his conviction, arguing that he had received ineffective assistance of counsel. Justices Anthony M. Kennedy, Ruth Bader Ginsburg, Stephen G. Breyer, Sonia Sotomayor and Elena Kagan joined the majority opinion in the case, Lee v. United States, No. 16-327. Justice Neil M. Gorsuch did not participate in the case, which was argued before he joined the court. In dissent, Justice Clarence Thomas, joined by Justice Samuel A. Alito Jr., wrote that Mr. Lee could not overcome the ordinary standard for proving ineffective assistance of counsel, which requires not only proof of flawed advice but also that the advice harmed the defendant. The evidence against Mr. Lee was exceptionally strong, Justice Thomas wrote. The police had found large quantities of drugs at his home, and prosecutors were prepared to present a witness ready to testify about buying drugs from Mr. Lee. The Supreme Court’s decision reversed one from the United States Court of Appeals for the Sixth Circuit, in Cincinnati, which had ruled that Mr. Lee had suffered no prejudice, as the correct legal advice would not have helped him. Had he gone to trial, the court said, he would have lost and still have been deported. But Judge Alice M. Batchelder, writing for the appeals court, seemed uneasy about what the law required. “It is unclear to us why it is in our national interests — much less the interests of justice — to exile a productive member of our society to a country he hasn’t lived in since childhood for committing a relatively small-time drug offense,” she wrote. “But our duty is neither to prosecute nor to pardon; it is simply to say ‘what the law is,’” she added, quoting Marbury v. Madison. Read the original article on the Telegraph. The United Kingdom goes to the polls – again – tomorrow after Theresa May, the Prime Minister, called a snap General Election in April. Both parties go into the final day of campaigning today with the race apparently much tighter than many expected a month ago. Despite ruling out a snap election when she took over after the Brexit referendum in June last year, Mrs May announced the vote in the hope that she can capitalise on internal divisions within the Labour Party and bolster the Conservative’s majority in the House of Commons. The Conservatives enjoyed a large lead at the beginning of the campaign and a good result for Mrs May on Thursday would give her a strong position as she negotiates a “hard Brexit” from the European Union. 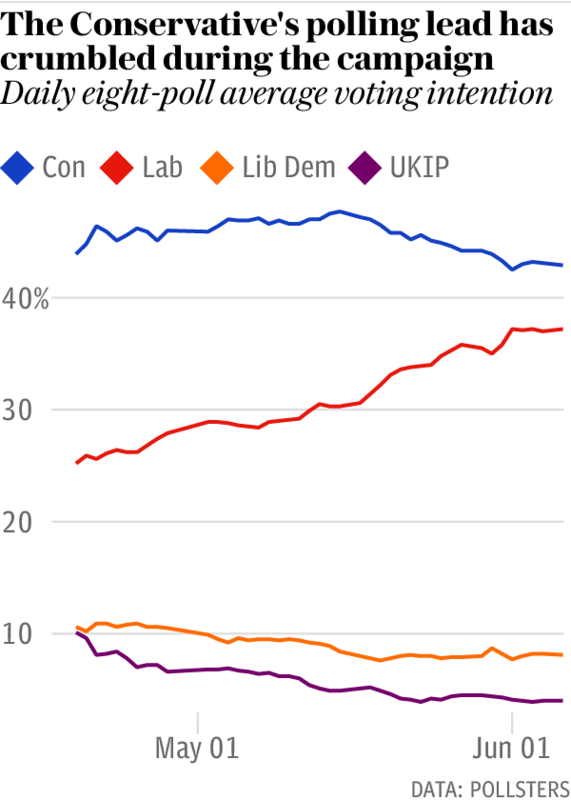 Labour continues to trail in the polls – even though the gap has narrowed significantly – but their leader Jeremy Corbyn is hoping to confound the pollsters in the same way Donald Trump did in November. The Liberal Democrats, meanwhile, are campaigning on an anti-Brexit platform. Here’s a rundown on the big issues from the election over the past week, why comparisons have been drawn between Mr Corbyn and the US president, and a guide to what you should look out for on election night. Has the London terror attack affected the election? Absolutely. The tragic events on Saturday night has had a significant impact on the race. All the major parties suspended campaigning for 24 hours on Sunday following the attack that killed at least seven people. It was the second time that national campaigning has been suspended during the current election campaign after it was halted for three days in the wake of the Manchester bomb attack on May 22. The atrocity even prompted calls on social media for the general election to be suspended, forcing Mrs May to stress on Sunday that it would go ahead as planned on Thursday. However it is the news agenda that has been most significantly affected. With just days until the election, the prime minister, who was previously the Home Secretary, has been forced on the defensive as she faces criticism of her record on counter-terrorism following the third terrorist outrage in the space of three months. In a speech that Mr Corbyn attacked as “political”, she said she would consider longer prison sentences for terrorist offences as well as reviewing the country’s entire counter-terrorism strategy in the face of a changing threat. On Tuesday, Mrs May vowed to start work on toughening anti-terrorism measures if she is re-elected and promised she would not let human rights laws stand in her way. The Prime Minister will make it easier to deport foreign terror suspects and will extend existing laws that restrict the freedom of British suspects. She has faced a barrage of questions about why the three Islamist terrorists who killed seven at the weekend were free to do it despite two of them being on the radar of the police or MI5. She has also been taken to task over a 20,000 reduction in police numbers under her watch. Certain sections of the press, meanwhile, have trained their sights on Mr Corbyn. Amid a slew of recent stories about the Labour leader’s past associations with IRA and Palestinian terrorists, Labour faced fierce headlines on Wednesday, including “Apologists for terror” and “Jezza’s jihadi comrades”. What has been the reaction to Trump’s tweets? Mrs May has come under fire for not standing up for London’s Mayor, Sadiq Khan, in the face of strong criticism from Donald Trump in the hours after the terror attack. The US President fired off a series of critical tweets over Mr Khan’s handling of the London Bridge terror attack, mocking the mayor’s comments that there was “no reason to be alarmed” over armed police on the streets. Mr Khan has called for the US President’s planned state visit to the UK to be scrapped. But while Mrs May said Mr Trump’s Twitter attacks were “wrong”, she said Mr Trump’s controversial trip would go ahead. Tom Brake, foreign affairs spokesman for the Liberal Democrats, said: “Theresa May has allowed Donald Trump 24 hours to bully the Mayor of London. It isn’t good enough. “Trump’s attack on Sadiq Khan was not only wrong, it was outrageous. Just as has been shown in so many other areas, when it comes to Trump, Theresa May is meek and mild, not strong and stable. A YouGov poll of 1,000 Londoners published on Monday found that Mr Khan was more trusted than both Mrs May and national Labour leader Jeremy Corbyn to make the right decisions about keeping Britain safe from terrorism. Is Jeremy Corbyn the British Donald Trump? They stand at opposite ends of the political spectrum in many ways, yet comparisons between the US president Donald Trump and the Labour leader Jeremy Corbyn have been made for months. Mr Corbyn even seemed to lift some lines from the Trump playbook in February by blasting the BBC for reporting “fake news”. The Labour leader has been frequently branded unelectable – a trait that was used to describe Mr Trump right up until he won the election in November. When the prime minister called the election in April, it looked set to be a coronation, much like Hillary Clinton was long expected to coast to the presidency. And yet, some polls now have the two candidates neck-and-neck. Mr Trump’s victory looms over the election. When asked by Politicowhat the odds were on Mr Corbyn winning on Thursday, a veteran BBC producer said: “Zero percent”. How are the polls looking? 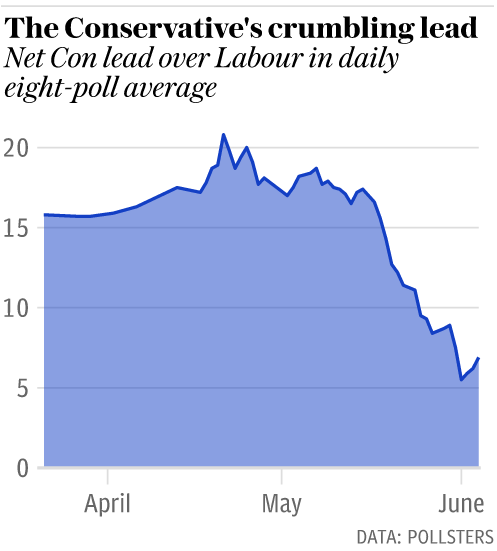 With just a day until the election, polls are showing that the gap between Labour and the Conservatives has narrowed further still. However, different polling companies are forecasting wildly different results. The latest poll from YouGov has the Tory lead at just four points over Labour, while ICM has it standing at 11 points. The situation is a far cry from the start of the election campaign, when Mrs May enjoyed a 17.8 point lead and polls indicated a landslide victory. But can we even trust the polls? Not according to Michael Moszynski, a pundit who correctly predicted the results of the EU Referendum, Scottish referendum and 2015 General Election within 0.3 per cent. Writing in The Telegraph, Mr Moszynski, chief Executive and Founder of London Advertising, said the Conservatives remain “safely on course for a three-figure majority”. What’s the schedule for election night? 5pm EST: Polls close at 10pm in the UK and exit polls are expected to be announced at the same time. 6pm EST: The first result should be called within the first hour of counting. 8pm EST: Things start to get serious around 1am BST as the first marginal seats are expected to be called. 10pm-12am EST: The busiest time for results to be announced will be between 3am and 5am BST. Conservative leader Theresa May should find out if she has held the Berkshire seat of Maidenhead around 4am – by that time she will have a good idea about whether she is still Prime Minister. 1.30am EST: At around 6.30am BST on Friday, the loser will be conceding defeat and the winner will be declaring victory.